What happens when a rock singer from the streets hooks up with a producer and co-writer that is an accomplished world renowned musician, writer, arranger and Philharmonic conductor? 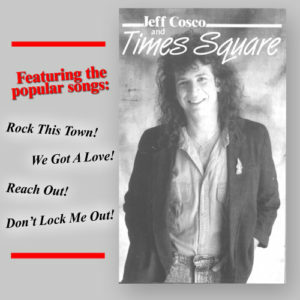 “Jeff Cosco and Times Square”. This unique team of Jeff Cosco and Jeff Tyzik brings you an incredible group of songs with world class production and instrumentation that will rock you and move you. Selecting from some of the best musicians in the world makes this a wonderful combination. Jeff’s vocals shine over the top of some of the best tracks you might ever hear. There is no mistaking that this is a pop/rock album. The added surprise is the edge! …Oh yeah, and by the way, use your headphones, you don’t want to miss a thing!